The Outlander's biggest change is a new 2.4-litre petrol engine which produces 135PS and 211Nm of torque, while two electric motors can take over entirely at speeds below 84mph. The plug-in hybrid SUV has attracted criticism in the past because its Real MPG falls woefully short of its claimed fuel economy figure - but the updated model has performed well under new WLTP fuel economy tests which are intended to reflect real-world conditions. Officially, it'll return 139mpg thanks to a 28-mile electric range and emit 46g/km CO2, putting it into the lowest company car tax band. As well as the new engine, the Outlander PHEV has been given revised suspension to improve its ride at low speeds, while a new Sport Mode increases throttle responsiveness and increases grip via the four-wheel-drive system. A Snow mode's also been added to improve handling in slippery conditions, while the steering's been tweaked to make it more responsive. Bigger front brake discs have been fitted to provide greater stopping power. The interior's been updated with more comfortable front sweats, new switchgear, a revised instrument cluster and more convenient USB ports. Cosmetic updates include a redesigned front grille, an updated bumper and tweaked headlights. There's also a new roof spoiler to the rear, while new two-tone 18-inch alloy wheels are also available. The 2019 Outlander PHEV is available in three specifications: the Juro, 4h and 4hs. 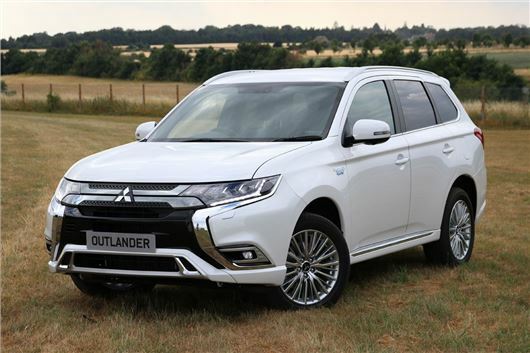 The entry-level Outlander PHEV Juro, which starts at £34,255 (including the government's £2500 plug-in car grant), features standard equipment including Apple CarPlay and Android Auto, an electronic pre-heater, heated front seats and dual-zone climate control. The Outlander PHEV 4h costs £37,000 and adds a 360-degree camera, blind-spot warning and rear-cross traffic alert. The interior now features a new black headlining, as well as an eight-way electric power driver's seat and heated steering wheel. LED headlights and foglights are also standard. Top-spec 4hs models feature adaptive cruise control, lane departure warning and forward collision mitigation, which applies the brakes if it detects an impending crash. Front and rear parking sensors are also standard, as is automatic high-beam. The new 2019 Mitsubishi Outlander PHEV is on sale now in the UK.